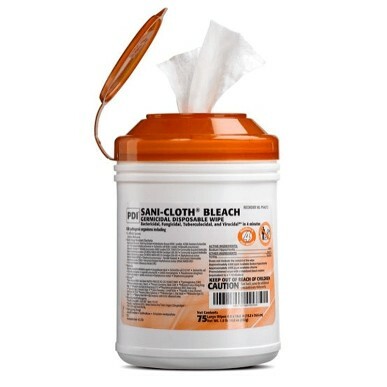 PDI Healthcare Sani-Cloth® Bleach wipes are effective against 50 microorganisms in 4 minutes. Ideal for disinfecting high risk areas endemic with Clostridium difficile spores and Norovirus. EPA-registered intermediate level disinfectant (1:10 Sodium Hypochlorite). Compatible with a broad range of surfaces and equipments in healthcare. Premoistened disposable wipes are 6" x 10.5". Large canister with single wipe dispenser on top. 75 wipes per canister, sold by the canister.